Filming in Crete – 1897 | The British in Crete, 1896 to 1913. British war correspondent and photographer Frederic Villiers (below) has some claim to be the first war cinematographer in history, and his efforts included film of events in Crete. 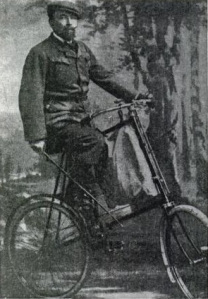 In April 1897, Villiers who at the time was working for the Standard and the Black and White, was in northern Greece covering the Greco – Turkish War, filmed the fighting on the Velestino front and at the battle of Domoko – a battle about which he claimed to have been given details of the time and place when the Ottoman attack would occur, by the Ottoman Commander. With the defeat of Greece, Villiers them went on to Crete and arrived there in time to film the celebrations of Queen Victoria’s Diamond Jubilee. While there are apparently some doubts about some of Villiers claims to have filmed rather than faked events in the Greco –Turkish war, his claim to have authentic film of events in Crete was backed up in 1935 in a letter from William Coyne to the Radio Times on 2nd August 1935, p.9. 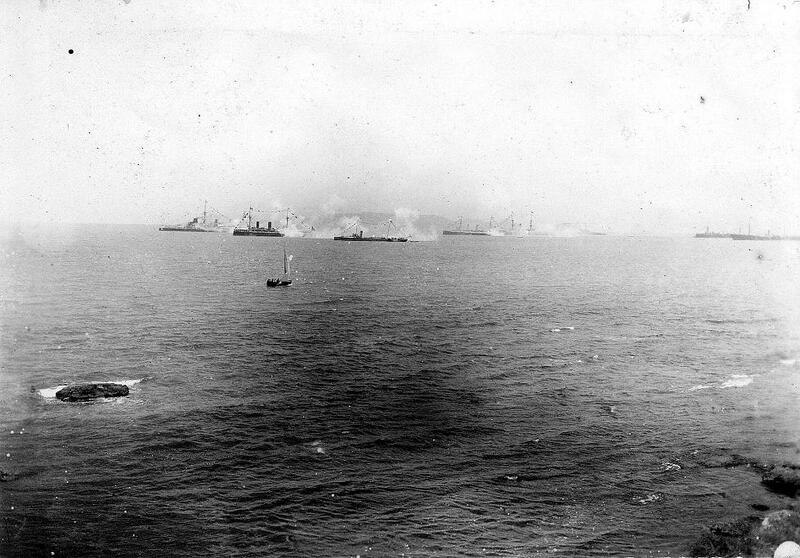 Coyne, who served on Crete with 1/Seaforth Highlanders and later fought at the Battle of Omdurman, reported that while in Candia watching the International warships firing a Royal salute, he saw ‘…Fred Villars (sic) with his tripod and camera filming the marvelous scene.’ Coyle also confirmed seeing Villiers filming during the Battle of Omdurman. 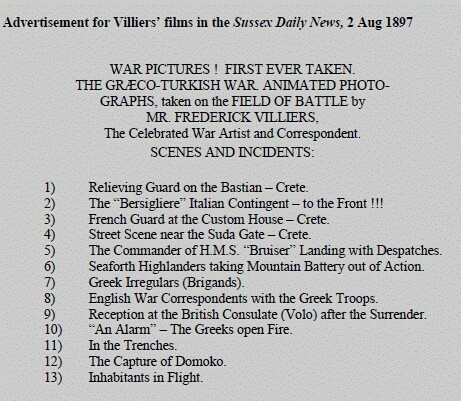 Further evidence of filming in Crete comes from the advertisements put in English newspapers announcing Villiers’ show. Advert for Villiers’ film show. Unfortunately, all Villiers’ films now appear to have been lost. Source material taken largely from: Stephen Bottomore, Filming, Faking and Propaganda: The Origins of the War Film, 1897-1902 (unpublished University of Utrecht PhD thesis, 2007), as is Sussex Daily News advert. This entry was posted in British Army in Crete, European Intervention Crete, Uncategorized and tagged Crete 1897, Fredric Villiers, movies 1897 Crete, Queen Victoria Jubilee 1897 on November 19, 2015 by Mick McT.